Dental implants are a total tooth replacement option for teeth previously extracted or congenitally (born without permanent tooth) missing. Anatomy of a dental implant? A single dental implant is comprised of three parts: a threaded root, an abutment, and a dental implant crown. A single tooth dental implant fills the space of one missing tooth. Two single dental tooth implants placed to fill the space of multiple missing teeth. Shown below is an implant supported traditional bridge. Placement of multiple, strategically placed dental implants to support a maxillary (top) or mandibular (bottom) denture. 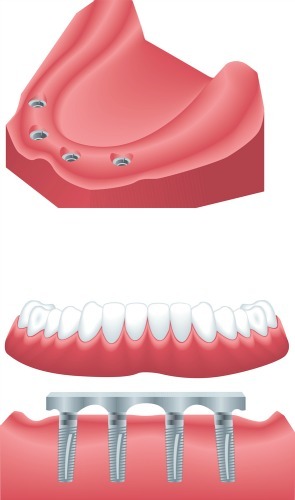 The illustration below shows one possible option with a mandibular (bottom) denture supported by four dental implants. There are a number of reasons for considering dental implants as a permanent restoration to replace missing teeth. Why should I consider a dental implant instead of other available restorative options like a traditional dental bridge? The dental implant procedure does not sacrifice adjacent healthy teeth as part of the preparation process. 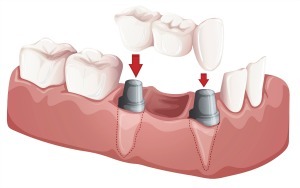 The illustration below depicts a single missing tooth with two treatment options to fill the missing tooth space. Place a three tooth traditional dental bridge to replace missing tooth (shown below right). 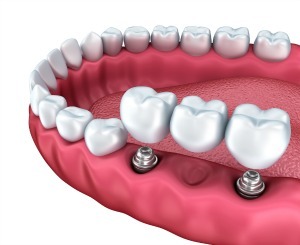 Placing a single tooth dental implant preserves the teeth adjacent to the missing tooth space. Placing a traditional dental bridge requires the dentist to alter each of the teeth adjacent to the space. If the teeth adjacent to the space have large existing dental restorations, a traditional dental bridge may be a better option. The missing tooth would be replaced and the adjacent teeth restored with a permanent dental restoration. If the teeth adjacent to the space are virgin (having no dental restorations), a dental implant may be a better choice because you do not have to sacrifice two healthy teeth in order to replace a single missing tooth. 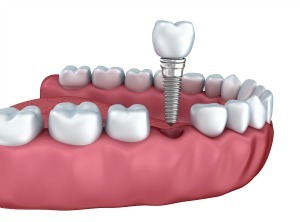 Placement of a dental implant requires an invasive surgery to place the artificial tooth root. A dental bridge does not. The process to complete a dental implant can range from four months to one year, where as a dental bridge may be completed in as little as two weeks. Dental insurance companies vary on level of coverage they provide for dental bridges and dental implants. This could impact your out of pocket expenses. During the consultation appointment, the specialist will perform an examination and review our referring notes. Afterwards they will review with you their findings and provide you options regarding treatment options. The specialist will send us documentation regarding their examination findings and discussed treatment options. Then its up to you to review your options, weigh the pros and cons of each option, and make an informed decision about which option is the best option for you. Depending upon which option you select, the next step will be to schedule an appointment to begin selected treatment. 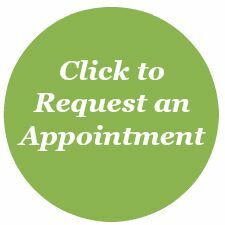 Call (763) 586-9988 to schedule a complimentary dental implant consultation or click the button below to request an appointment online. Most dental implants follow a three step process and take between four to twelve months to complete. Dental implant surgeon will surgically place dental implant into the jawbone in the space of your missing tooth. Immediately following the surgery, a protective dressing will be placed over the surgical site to help protect surgical site during the initial healing phase. The surgeon will review post surgery instructions and schedule necessary follow up appointments. The surgeon will evaluate the dental implant root to ensure that the surrounding bone integrated with the dental implant. This is critical regarding the long term success for the dental implant. Once the dental implant has fully integrated with the surrounding bone, the implant surgeon will expose the implant and affix a dental implant abutment to the dental implant root. Additional healing time is necessary to allow the surrounding gum tissue to heal, typically a couple of weeks. This step is completed by your dentist at Dentistry for the Entire Family. Your dentist will preform dental implant preparation procedures, take necessary dental impressions, and select a complementary tooth shade to adjacent teeth. Your dental impressions are sent to a dental lab who will fabricate your permanent dental implant restoration (dental implant crown, dental implant supported bridge, or implant supported denture). Final appointment will include permanent cementation of your dental implant crown, bridge, or delivery of your dental implant supported denture. Just like your natural teeth, caring for your dental implant requires daily brushing and flossing. Your dental implant is not prone to dental caries (cavities), the surrounding gum tissue is susceptible to gingival inflammation. Once your dental implant treatment is complete, your dental assistant will show you how to properly care, clean, and maintain your dental implant(s). Your dentist will recheck your dental implant at every future preventive visit as well. Q. What is the success rate for dental implants? A. Dental implants do not have a 100% success rate. “Long term success rates are in the high 90% range” (source: osseo.org) and are continuing to improve with advancements in dental implant technology. A. Only you can make that decision. Your dentist will discuss your specific treatment options including the advantages and considerations of each option so that you can make an informed decision. Additionally, one of our patient care coordinators will review your estimated proposed treatment costs for each option. Dentistry for the Entire Family offers complimentary dental implant consultations. Call (763) 586-9988 or click to request an appointment online. Prior to making your decision, both the implant surgeon and Dentistry for the Entire Family’s patient care coordinators will provide you an estimation of dental insurance benefits and out of pocket costs. Q. Are dental implants covered by dental insurance? A. Not all dental insurance plans provide dental implant benefits. If you are unsure whether you dental insurance plan does or not, one of our patient care coordinators would be happy to submit a predetermination of dental insurance benefits on your behalf. Dental insurance response varies from a few days up to six weeks. If you’d like, you can call your dental insurance subscriber and ask them about dental implant benefit coverage.